In order to put together a list on 35 of the best live-action comic book and graphic novel adaptations of all time, one must be predisposed toward accepting some silly things, but I must admit that when Thor was first announced I didn’t think it would work. Time and digital ink has been spent in numerous other entries on this list discussing the oftentimes dichotomous relationship between adapting highly stylized, over-the-top fantastical stories and bringing along more grounded audiences who need their stories to make a certain kind of real-world sense. It was the latter audience that so often necessitated changes to characters I’d loved over the years and why I feared Thor would either be gutted to suit them or conversely too strange to appeal to them. And I was wrong. Not only was Thor a perfectly enjoyable movie for all audiences, whether they were aware of the MCU or not, but it was so good it created a movie star in Chris Hemsworth. He nailed the fish-out-of-water-behemoth role and allowed most of that “grounding” work to be done by the always splendid Natalie Portman as Jane Foster. Portman immediately became one of the best actors to grace one of these adaptations but the fact that Hemsworth went from virtual unknown to hosting Saturday Night Live because of this role tells you just how good he was. Portman and Hemsowrth humanize what is essentially the story of a near-indestructible God of Thunder traveling by light in order to protect the galaxy from Ice Giants. 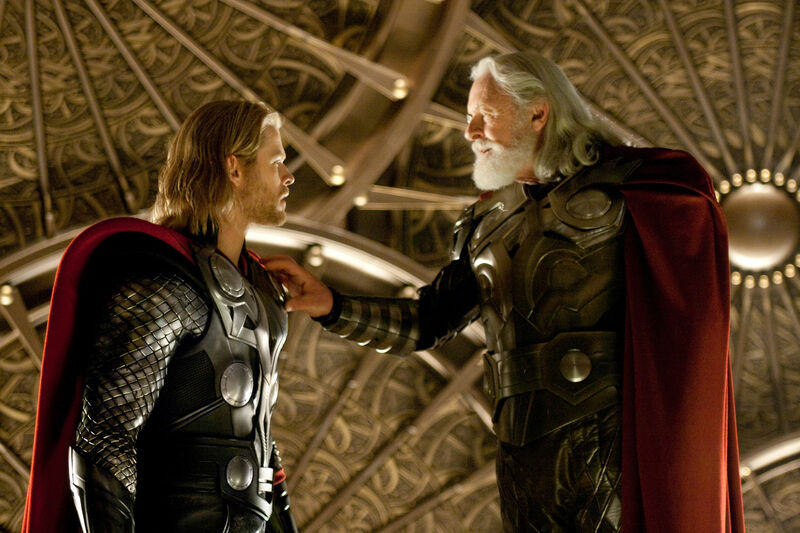 It was also nice of Anthony Hopkins to stop by as the Allfather (Odin) to lend a little extra gravitas to the film. Hemsworth was not the only actor whose career was put into hyper-drive by this movie, though. Tom Hiddleston (Loki) is currently emerging as one of my favorite working actors but in Thor emerged as the most important villain in the Marvel Cinematic Universe. His ability to strike that perfect balance between haunting, sympathetic, funny, and cruel was desperately needed in a universe severely lacking quality baddies. Because Marvel Studio’s did not have the rights to the Spider-Man series until recently, their best antagonists were largely unavailable. Hugo Weaving’s Red Skull was the most memorable to that point, but also clearly out of the picture. Hiddleston’s Loki was the most important revelation for the first Thor. He went on to anchor and balance out six heroes all by himself (in terms of performance) in The Avengers. He doesn’t get enough credit for being the human face behind pretty much all of the conflict in the Marvel Cinematic Universe. This is flick that a fan of the subject matter thought would fail. To go from that wavelength to perfectly nailing two massively important characters to such an extent that it created megastars of the actors who portrayed them is pretty incredible. Beyond all that, this movie is just fun as hell. They didn’t skimp on style, allowing the alien landscapes to burst with colors and shine, giving audiences just enough time on Earth to make it all feel personal. Star of Agents of S.H.I.E.L.D. Clark Greggs as Agent Coulson really shines in the first time in this universe in Thor as well, likely planting the seeds for that whole awesome show to even exist. It cannot be understated how important it was for the rest of the cinematic universe – and colorful comic book adaptations in general – that this movie worked. It showed how fun and aesthetically driven movies can still be brimming with heart. No longer were we bound by the rules of our own experience. “What you call magic, we call science,” Thor tells us. Getting audiences to accept that opened the floodgates for all the weirdest (and I might argue coolest) stuff in Marvel history to come pouring through.